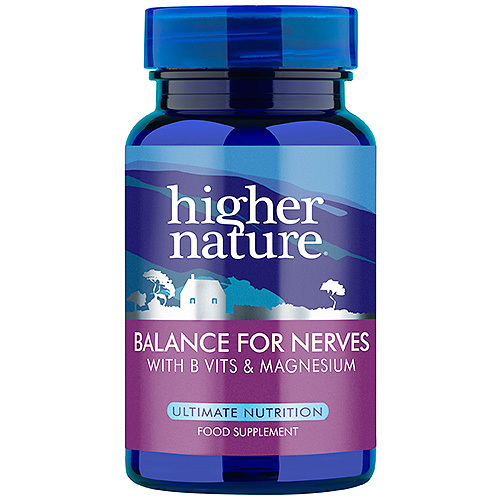 Balance for Nerves is a nutritional complex for nervous system health and provides a special formulation of vitamins, amino acids and Magnesium to support the nervous system and mind. It includes Taurine, Theanine and B vitamins. Does Not Contain: Artificial colours, flavourings or preservatives, dairy products, gluten, lactose, salt, soya, sugar, wheat, yeast. L-Taurine, magnesium citrate, capsule: hypromellose (carrageenan)*, calcium d-pantothenate, lemon balm (melissa officinalis), passion flower (passiflora incarnata) 4:1 extract, bulking agent: microcrystalline cellulose, l-theanine, niacin (as nicotinamide), anti-caking agent, silicon dioxide, pyridoxal, 5-phosphate, anti-caking agent, magnesium stearate, pyridoxine HCI, folic acid (as pteroyl glutamic acid), methylcobalamin. Adults: Take 2 vegicaps once or twice a day, or as your health professional advises. Children over 6 years old: Take 1 vegicap a day, or as your health professional advises. Below are reviews of Balance for Nerves - B Complex - 90 Vegicaps by bodykind customers. If you have tried this product we'd love to hear what you think so please leave a review. Great product. Have found this product to be quite helpful coming off ads. In particular feeling less tired and more relaxed. Added benefit of non addictive. Great product, very natural result, non addictive. I have been taking this product for a few years and I really do feel better overall when I am taking it. I like the fact magnesium is included as well. 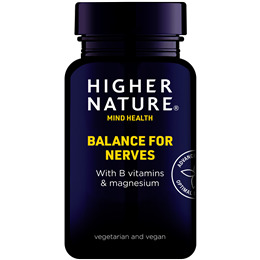 Balance for Nerves is a nutritional complex for nervous system health and provides a special formulation of vitamins, amino acids and Magnesium to support the nervous system and mind.